Uriel Falex Robertson was born 25 August 1923 and died 19 May 1944. His parents were George Bryant Robertson and Myrtle Irene Shatterly Robertson of Graham, North Carolina. Uriel was the fifth of seven children. When he was born, Roy was eight, Mildred seven, Lucile four and Helen two. Lester was born a couple of years later and Ann completed the family when Uriel was nine. When Uriel was only three, his sister Mildred died. Uriel's nickname was "Skinny," but his mother always called him "Boy." Uncle Gurney was the one who named him. The name, "Uriel Falex," was copied out of the Bible, so goes the tale. Do you wonder why we called him Skinny? As a youngster, Uriel loved airplanes and, with his brother Roy, built models out of balsa wood in the workshop in the barn. He loved arcade machines and spent many quarters shooting down airplanes. Skinny played basketball in school. He was a good player - small, but very fast. He was a good singer and sang at the Methodist Church in Graham, North Carolina, starting at an early age when he had to stand on a box so he could be seen by the audience. He sang beautifully in a quartet. His sister Helen named her twins after Skinny - Uriel Dean Foster and Uriel Jean Foster. In talking to many different people, the one fact that kept coming up was, "Skinny was a sweet, easy going young man." He was loved and is still loved today. We miss that sweet, shining face. His enlistment file says he was inducted on 5 Jan 1943 at Camp Croft, South Carolina. It also shows he was a high school graduate and single without dependents. Assumption is Uriel went through the manditory Basic Training and Aerial Gunnery School. The group records show his MOS (Military Occupational Specialty) as 758. Perhaps this is a typo because there wasn't any such number at the time, see Footnotes. It's unknown at this time if he was trained for anything else before joining the Arnett Crew at Salt Lake City in the fall of the same year. Uriel trained with his crew at the Combat Crew Training School in Tucson, Arizona. He was assigned to the top turret guns. During the first week of January, his crew was transferred to the new 492nd BG at Alamogordo, New Mexico. They were assigned to the 857th BS and designated as Crew 717. After extensive training at Alamogordo, the 492nd departed for England in April 1944. Uriel flew overseas with his crew using the Southern route, down to Brazil, over to Africa and up to the United Kingdom. His crew arrived on the last day of April. Uriel flew all three of his combat missions with his crew. On 19 May 44, his plane was shot up by the Luftwaffe near their target at Brunswick, Germany. More details can be found on his crew page, see Arnett Crew 717. His navigator, Ernie Gavitt, recounts the story with mixed emotions. With only two engines running, the crew thought they could limp their way back to England. But soon after entering the Channel along the Dutch coast another engine failed and they were losing altitude fast. It took everything they had to reach the Dutch coast again on one engine. By then they were flying at 400 feet and dropping. Rather than attempt a low level bail out, the crew elected to ride the plane down as the pilots would try their best to crashland it. Ernie felt the pilots could use an extra pair of eyes to find a field long enough to land in so he wedged himself into the cockpit looking for a place. There wasn't much time as the plane was quickly going down on its own. No fields long enough for a landing could be seen. At the last moment, the pilots decided to attempt their landing using multiple fields. This required jumping the canals that divided the fields. Ernie went back to take his crash position with Uriel. Crashlanding was practiced during training. Every crewman had his assigned spot and knew what to do. Ernie's position was to sit on the floor with his back against the pilot's bulkhead. He was to spread his legs so Uriel could sit in between them, like two people riding a sled. Uriel was already sitting in Ernie's spot. "You're in my place," said Ernie. "What's the difference? I'm already here," replied Uriel. With no time to argue Ernie sat in between Uriel's legs. Their plane lost its wheels as it clipped the far bank of the second canal they jumped. The plane then slid on its belly across the muddy field. During all of this, the plane buckled and the overhead hatch behind the bulkhead jarred open. The hatch door swung down and clobbered both men in the head. Uriel was killed on impact. Ernie was knocked out and bleeding heavily from his head wound. The Germans had the plane surrounded before any of the crew could get out for they had landed in the middle of an anti-aircraft battery manned by 800 soldiers. After the crew got out, a quick count showed they were missing two men, Ernie and Uriel. With hand signs and jibberish, the German soldiers understood there were more inside. Two crewmen were allowed back inside to find them. As they went in Ernie had just come to his senses, although still dazed. They carried Uriel out and laid him out on the field. The Germans took their prisoners to a farmer's house nearby. It was the last time any of them would see Uriel. The Germans left it to the local citizens of Tuitjenhorn to bury Uriel's body. They mourned for Uriel and buried him in a church cemetery at nearby Eenigenburg, another small rural community consisting of a few homes and one church. They adopted Uriel as their own son, to represent all of the Allied soldiers who gave their lives for their freedom. And even today, most the Dutch citizens in that area know the name Uriel Robertson and who he was. Case-in-point, we got the above photo of Uriel from Co Maarschalkerweerd, a Dutchman living in Amsterdam. There are probably more photo collections (and information) in Holland of Uriel and his crew than anywhere else. After the war, the US Army took Uriel away and reburied him at the Ardennes American National Cemetery. He remained there for a short time, until his family requested he be brought back to North Carolina so they could find closure. On the grand scale of World War II, his service and sacrifice was a tiny sliver. However, few men with such minor roles are honored and remembered by so many. Uriel Robertson is forever remembered by his family, his comrades and their families and by a numerous amount of people living in North Carolina and Holland. 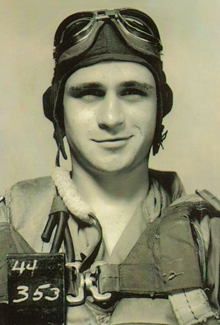 His pilot, Charles Arnett reflects, "A long life might not be good enough, but a good life is always long enough. And Uriel lived a good life."